Nineteen fifty-nine was a pivotal year in the history of UPA (United Productions of America). It was the last year in which UPA released a regular series of theatrical cartoons. The very last one, appropriately entitled Terror Faces Magoo, was released on July 9, 1959. 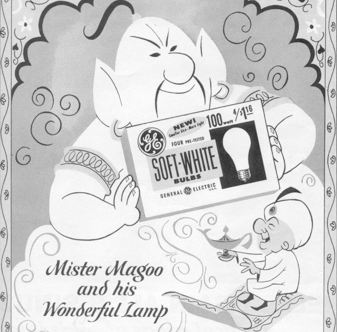 That same year, Stephen Bosustow, the head of UPA, entered into negotiations with Henry G. Saperstein to produce a series of Mr. Magoo cartoons for the small screen. Negotiations also began for the sale of UPA to Saperstein and his partners (the deal concluded in 1960). In the last month of the year, Columbia Pictures released UPA’s first animated feature, 1001 Arabian Nights. To put this year of activity into context, take a look at this fascinating timeline, “Cartoons of 1959.” Some highlights: Terrytoons celebrated thirty years of business; Walter Lantz celebrated forty years in the business; Hanna-Barbera worked on Huckleberry Hound and The Ruff and Reddy Show; June Foray signed an agreement to record voices for Rocky and His Friends; King Features began producing 208 episodes of Popeye for syndication; and Clutch Cargo aired on television (the show later would later feature in the film Pulp Fiction). 1001 Arabian Nights premiered in December. Greeted by lukewarm reviews, it signaled the end of the Bosustow-era UPA.